The website development industry remains divided into two separate thoughts. One school of thought says that developers should use tables for designing web pages. While other group claims that Cascading Style Sheets (CSS) are the best tools for building portals at faster pace. Do you know what the benefits of using CSS are? Read them here. The success of a website is defined by a good user interface. Sites and applications that do not provide a good user experience are often frustrating to users. You could have very good content on your site but if the user interface is not appealing, customers will ignore it. Your goal when designing a user interface should be to please the visitors who will visit your site. You have to consider what they want and endeavor to give it to them in a simple yet tasteful and uncomplicated manner. There are no oracles that can help us understand the future of tech industry and the corresponding changes in software and design. Instead, at ECA Technologies Inc, Designtorontoweb.ca and 2seo.com, we track the latest trends and try to predict where they’ll head. These are our predictions of growing trends over the next 12 months on web design and development. The ten most common offenses are against the users. Web design disasters and HTML horrors are growing in numbers, though many usability mayhems are less common than they used to be. Read the 10 below and make changes accordingly if needed…. You be the judge…. Seeing what Google did to its search algorithms in 2012, sturdier and more aggressive actions and steps are expected from the search hulk in 2013 as well. And the likes of Google are expected to shadow the footsteps. Although, webmasters cannot overlook the fact that all these efforts are meant to revive the original intentions of the web viz. Presenting superiority and relevant information to its users. At the same time, the SEO companies and experts are left with no option, but to revise their SEO strategy. How should you do that for better SEO success in the New Year? SEO companies and SEO experts have long howled that “content is the ruler and key” We at Designtorontoweb.ca know that Quality content affects both the quality and amount of inbound links.” By: Mark Jackson 2007, what does this statement mean? It’s that all you need to do to get good links is to build quality content? The realm of web design can change at a dizzying rate. We at ECA technologies are very aware that our clients are concerned with staying relevant in the online marketing and media frenzy of the digital age. The web industry is constantly evolving, yesterday’s side bar widget is today’s large header image; code rapidly changing to HTML 5, jquery, CSS3 etc. It is our job to keep up with these trends. More importantly, it is our job to make sure these trends continue to be relevant for our clients needs. (You may not need the bells and whistles and we’re here to see the flower for the weeds when it comes to your web design needs). That being said, it is always good to know what trends are here to stay. 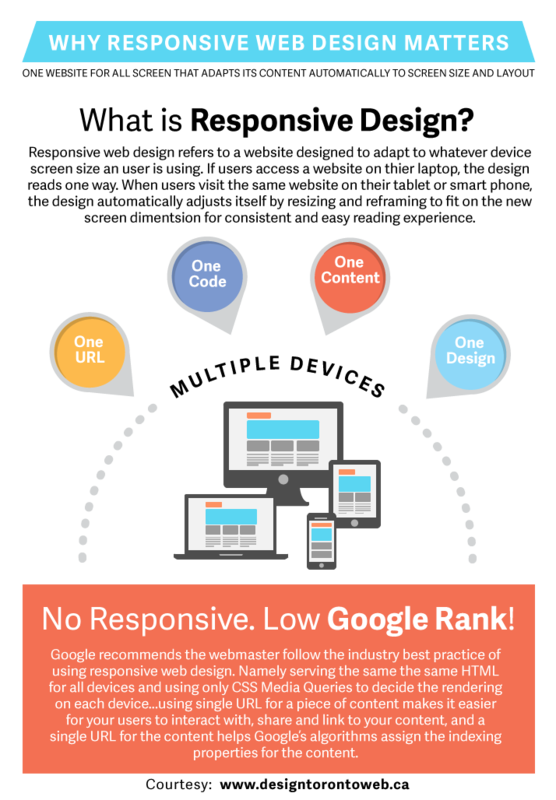 For the foreseeable future, the latest and greatest trend is Responsive Websites Design. In today’s world of competitive online marketing, we at ECA Technologies express the simple purpose of an e-commerce website is to make businesses sell products and services online. Its development and designing is also unlike from the traditional websites. Here, more than keeping an eye on aesthetic features like color schemes and flash, you are required to give importance to usability of the website. It is imperative to give users a seamless enjoyable shopping experience on your website. SEO(Search Engine Optimization) is also a very important influence in Ecommerce web design. In today’s professional world of 2012 having a website is a must for every business small or large. In today’s steadfast paced life everyone wants everything on their fingertips and immediately. Hundreds even thousands of businesses market and sell different products online at different rates. Web design plays a crucial role in such circumstances. Web designing is an art that appeals the users with texts and graphics. A website represents a business among its customers. Using the web design for promotions and sales is a essential in today’s ever changing world.